From the author of the New York Times-bestselling and Edgar Award-winning The Expats, comes a new tale that’s set in the backdrop of the publishing industry. The Accident revolves around the lives of several characters. There’s a literary agent who’s just read a mysterious, anonymous script that reveals the true-life events of a powerful person. Then there’s the author himself, stationed in Zurich, hiding in a shadowy expat life. In Copenhagen, veteran CIA operative Hayden Gray is determined to let this sweeping story be buried. Then, there’s Jeff Fielder, an editor who the literary agent, Isabel Reed, hands the manuscript to and asks that he keep it top secret. But, in an office where everyone is trying to climb up the corporate ladder, there are deceptions and the manuscript doesn’t stay in its singular form. 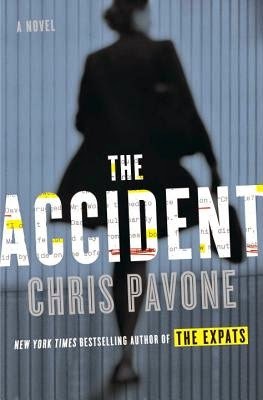 There is no shortage of characters in Chris Pavone’s The Accident, which makes the story interesting but also thins out the possibility of stronger characters. Each chapter is told from a particular character’s perspective, and it is challenging and tiring to keep up with the story, especially at the beginning of the book. Once you get on a roll, you realize that they actually do have a purpose within the narrative. The Accident tries to be everything to everyone, and is a bit over ambitious in its plotlines. Don’t get me wrong; it has all the elements of a thriller, suspense novel, and a lot of people will probably enjoy it. I did. But, having read quite a few thrillers and espionage novels in the last few months, I can’t help but compare The Accident to them, including The Runner, and The Pilgrim (to come out later this year). This makes me somewhat biased and critical in my assessment. What I do love about Chris Pavone’s The Accident is the fact that it’s set in the cutthroat world of publishing. Very few writers use this platform, and this makes it relatable and believable. The novel hooks us right in with the dangerous manuscript, and keeps our curiously following, in the hopes of the winning us over with the shocking revelation of something big. If you read the book, please do let me know what you thought. The Accident is published by Crown Publishing Group, a division of Random House LLC, a Penguin Random House Company, New York.